If you are looking for a simple gravy yet a dish that makes its presence felt, then I recommend you make this Dum Cauliflower. 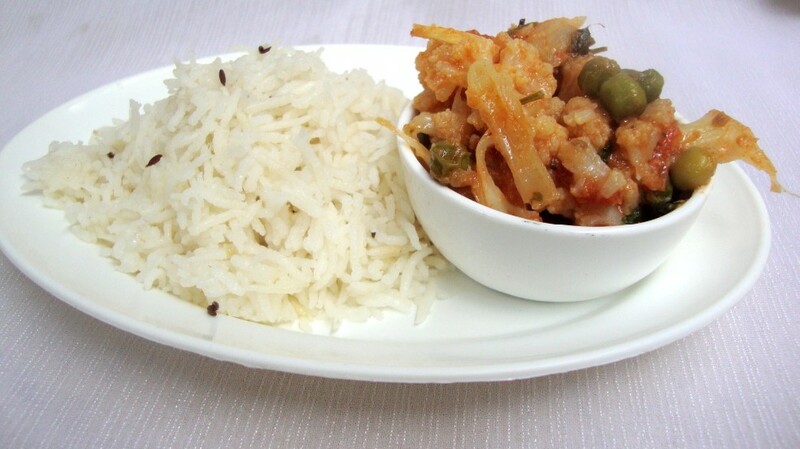 We make this as a side for the Peas Pulao which ends up being bland for the elders. And you can serve this for Naans, Rotis too. If cauliflower is your favorite, then this is a must to try. During every cauliflower season. I make sure I try all possible new dishes with the cauliflower. I simply love the way the streets over flow with these pretty flowers. Though I tried as many dishes I could, I still couldn't try one dish as it called for a small flower and most ones that are sold are really huge. So when I made the peas pulao, the kids had just that and this combo had the elders reaching out more. 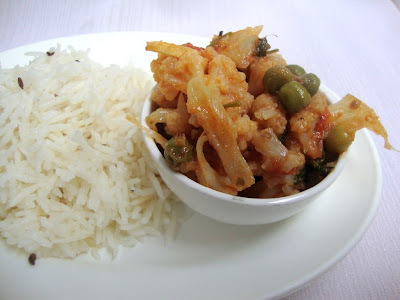 When Amma shared this recipe with me, I was reluctant to add those Ginger juliennes in the end, saying I can't somehow like that lingering ginger taste. And kids will surely not like it. But if you add very little of them, the ginger surely adds that extra kick required. I apologize for the dull pictures, they don't do justice to the taste.